Corfu, the wooded isle of the Phaeacians, Odysseeus last stop on his long journey home to Ithaca, is the best known of the Ionian islands. On this cosmopolitan island, youll be able to combine relaxation with good times and a full nightlife, for Corfu is an international tourist centre which can satisfy the demands of the most difficult visitor. 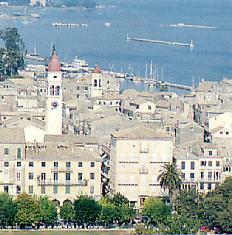 The capital of the island is also called Corfu (Kerkira). It is built on a promontory that projects into the sea and is separated into a northern and a southern part lies the Old Fortress, cut off from the town by a moat. 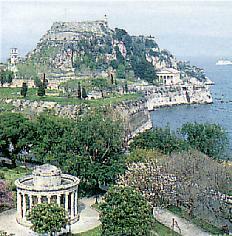 For centuries all the popular of Corfu lived within this citadel, which was founded by the Byzantines but greatly expanded and strengthened by the Venetians. The town of Corfu is made up of completely dissimilar elements, left over from different civilization. It presents an enchanting picture with its broad streets and spacious squares, the popular Spianada-the town green  contrasting with its narrow back alleys paved with blocks of stone (Known as Kantounia), houses with a strong Italian influence, the famous Liston, a French arcade, traditional Geogian mansions, a Byzantine Church, Venetian monuments, balconies with wroughtiron railings and window grilles. The Archaeological Museum: tel. : 30680-38124, the Byzantine Museum housed in the Church of the Panayia Antivouniotissa (closed for the time being); the Museum of Oriental Art: tel 30.443-38.124, in the English Palace of St. Michael and St. George; The Town Hall, a superb example of Venetian architecture built in 1663; the Byzantine church of Sts. Jason and Sosipater (12th century) with fine frescoes; the church of Corfus patron Saint Spyridon with its valuable icons and collection of gold and silver ex voto offerings; the Old Fort; the New Fort, constructed between 1576 and 1588 (not open to the public); and the Platytera Monastery with its rare post-Byzantine icons. Paleokastritsa, 26 kilometres west of Corfu town, a miniature earthly paradise with its crystal clear waters, enchanting coves and lush greenery growing right up to the sea. Angelokastro, near Paleokastritsa, a Byzantine fortress. dating from the l3th century. Pelekas, 13 kilometres west of the town, a lovely village set on a rocky hill, whose summit - according to the Corfiots say - is the best place to watch the sun go down. Not far from Pelekas in the Ropa Valley is situated Corfu's excellent golf course. Kanoni, 4 kilometres south of town is the most popular spot on the island. Here a narrow causeway leads across the water to the Monastery of Vlacherna and from there one can take a caique to visit delightful Pondikonissi and its l3th century church. Gastouri, a picturesque hill village, is the site of the Achillion, the summer palace of the Empress Elizabeth of Austria and the last Kaiser. The Palace has many beautiful gardens ideal for a romantic walk. A part of it places an important museum as well. Other sights not to be missed include �n the east side of the island Kassiopi, Ipsos, Dassia, Gouvla, Benitses, Moraltika and Messongi. �n its west side Lake Korission (Limni Korission), the only lake on the island. �n the northern part of the island are the resorts of Sidari, with its sandy beach, and Roda, whose beach is even longer. 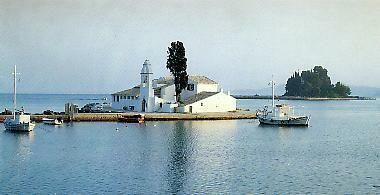 From Sidari you can take a boat to the three picturesque offshore islands of Erikoussa, Mathraki and Othoni. Their sheltered anchorages are ideal for swimming and sunbathing. But Corfu also has another side: a vital traditional facet to its personality still very much alive in the constumes of its village women and in its local festivals. Fine examples of folk art and crafts are displayed in shops all over the island: hand woven textiles and embroideries with intricate designs, objects of all kinds carved out of olive wood, silver utensils and lovely jewerly.